After missing out last week due to nothing much to tell, I’m joining Ginny’s Yarn along again this week to say: Yeah, I finished two projects and the book I’ve been reading for quite some time and it is time to say goodbye to knitting for the next two weeks! 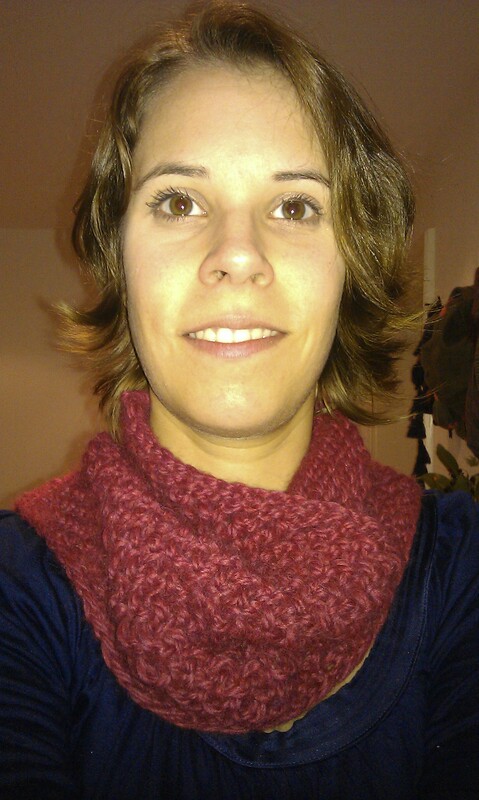 I finally finished my cowl. I only had 100g of this gorgous baby alpaka wool so I had to make the best of it. I actually really like the outcome even though I took me several newstarts as the wool was never enough and the thing never really fitted. It is wider at the bottom, so I can draw it down a bit (well, nearly over my shoulders), and gets more fitted around the neck. It would actually fit really tight at least this is how I planned it to be, but I completely forgot that my head is obviously wider than my neck is… 😉 So I had to leave the back open a bit to get it over my head… I might add a small button though, to be able to really make it close tight around my neck when it gets colder. 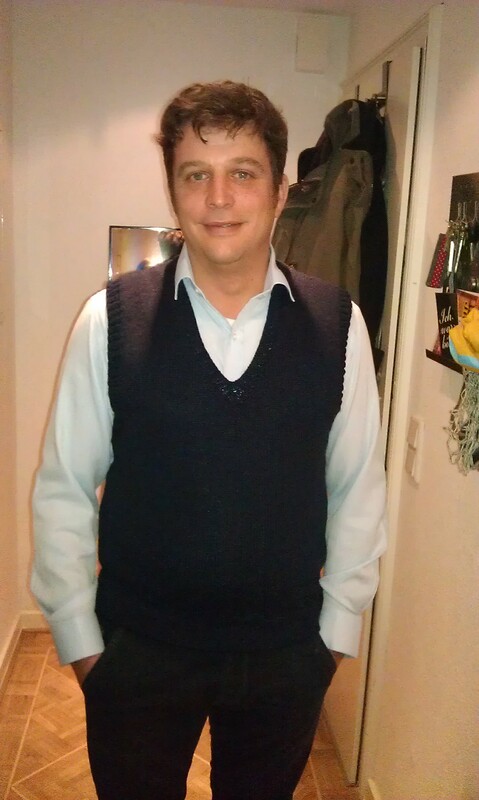 I also finally finished Michael’s sleeveless sweater vest yesterday and he is wearing it for the first tonight. I’m glad he likes it and it does fit now after a new start here too. It is actually a bit long (which luckily doesn’t show too much) and now I think I got a feeling for his size. Maybe I’ll be making a proper sweater or a cardigan for him later this winter. Visiting my parents on the weekend I brought back home so much wool from my mum that there might be something that could get a second live as this new project. Actually there is so much wool, some more projects might come out of this. Funny enough, this wool that has been used before, ripped and straightend again – I get the feeling we have been doing this for ages in my family – but unfortunately for the last 20 years, nobody ever knitted again with this wool, so it has been sitting in my mum’s basements (definitively clean and dry and hopefully also not being feasted upon by moths…) until I finally took it with me on Monday. So stay tuned to find out what I’ll be doing with it. We are going to Egypt tomorrow morning for a week of cruising the Nile and then a week of simply baking on the beach in a hopefully lovely hotel. I’m so excited. After being to Cambodia and seeing Angkor Wat I always wanted to visit all those tombs and temples in Egypt. I actually thought about it when we came back from Thailand already. And now we are doing it. It will be great for sure! And we have plenty to read so I could even join the yarn along for the reading part the next few weeks… On the list are: Jussi Adler Olsen: The Keeper of Lost Causes and The Absent One (part 1 and 2 of the Departement Q series), Alan Bradley: the first of the Flavia de Luce Mysteries (I read the second one already and I so love that kid with her weird thoughts), and some more books that are already packed deep down in my bag. Good thing that Michael and me like to read the same sort of books so we only take books we both haven’t read yet so we can swap. So stay tuned for news in the travel section in the next few weeks. I’ll try to literally keep you posted with stories and pictures from Egypt, hoping we find places with Wireless Internet just like in Thailand this January. like this cowl…I have a quilt project and some kid activities that are taking up my knitting/reading time right now and it’s making me testy!! Thanks for the inspiration to get a move on!